You may not think that a rat is worthy of its very own San Diego Zoo animal fact page, but the African giant pouched rat is no ordinary rodent! These animals are intelligent, energetic, friendly, and pretty cute…if you squint one eye. And they have a nose that knows. About the size of a small domestic cat, these agile rodents have been trained to detect landmines and buried explosives left over from wars. They have worked in seven countries, including Cambodia, Angola, and Mozambique, securing areas so local people can live safely. Another humanitarian task the rats are trained for is detecting tuberculosis (TB) in samples collected in hospitals. TB is one of the world’s deadliest infectious diseases, and the detection rats hasten discovery of the disease for a fraction of the cost. There are two species of African giant pouched rat: Cricetomys emini and C. gambianus. The latter is the working species used in landmine and TB detection, and the type that will be joining the San Diego Zoo’s new Sanford Children’s Zoo, opening in 2021. Giant Backstory: Twenty years ago, a Belgium fellow named Bart Weetjens founded the nonprofit organization APOPO, which harnesses the highly attuned sense of smell in the African giant pouched rat to make the world a better place. As a teenager, Bart had trained his own pet rats to find hidden objects for treats; and as an adult, he wondered if rats could be trained to find hidden explosives. After receiving a grant from the Belgium government, the APOPO project was born, and later expanded to include TB detection. His raring rodents became known as Hero Rats. According to their website, these rodents have helped clear over 106,000 landmines and identified over 12,000 TB-positive patients in Tanzania and Mozambique (a TB detection facility is being built in Ethiopia). Working Rats. 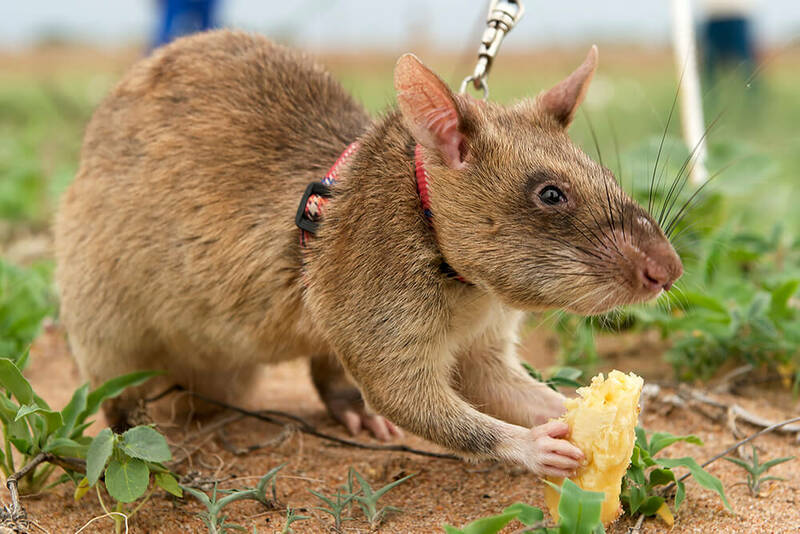 One huge advantage to using African giant pouched rats for landmine detection is the speed at which they efficiently find actual explosives and ignore other debris like coins, nuts and bolts, and other scrap metal. One highly trained rat can check 2,200 square feet (200 square meters)—about the size of a tennis court—in about 20 minutes. It would take a technician with a minesweeper up to four days to clear the same amount of space. Additionally, the rats are indigenous to sub-Saharan Africa, so they are well-adapted to heat and resistant to many tropical diseases. The rats are widely available and easy to procure, though not all will succeed at the rigorous training program. Weighing 2 to 3 pounds (1 to 1.4 kilograms) on average, the pouched rats are easy to transport, and they are light enough to not trigger the random explosives in field sites (a landmine requires at least 11 pounds (5 kilograms) of pressure to be activated). Long lived for a rodent, their six- to eight-year lifespan makes training a worthwhile investment. They are food motivated, and willing to work with just about any handler for a proper reward. Works for Peanuts…and Bananas. Convincing a three-pound rat to do your landmine detection bidding and do it correctly takes a bit of patience. The APOPO website explains the procedure: When the pouched rats are weaned, at around four weeks of age, they begin to socialize the animals to get them used to being handled and exposed to a variety of sights and sounds. Positive reinforcement is used, and soon the rats learn to associate the sound of the clicker with a food reward (banana or a banana-peanut paste is their favorite). Training sessions last about 30 minutes, 5 days a week (they get weekends off to relax). They are trained to indicate which hole in a line contains TNT (an explosive) by nosing it for five seconds. After “odor imprint,” the work gets more difficult. They are exposed to various scents before progressing to sandbox training, where the target scent is buried and the rat must walk in “lanes,” up and down systematically, to scout the entire area. Finally, the rat is trained to wear a harness and practice outdoors on a lead, finding inactive mines under the soil. At the end of the training, they are given a 2-day final exam: they must find all the mines in an area of 480 square yards (400 square meters) randomly spiked with inactive mines. Even the handlers do not know where the mines are located. The rats must score 100 percent on the test to become certified landmine-sniffing rats. When the professional rat is working an area, it scratches at the ground when an explosive is detected; the handlers mark the spot, and the landmine is safely removed later. Fur and Fanfare. An African giant pouched rat can reach three feet in length, with half of that consisting of a hairless tail. Unlike domestic rats, these giants have cheek pouches like hamsters, which they fill with nuts at night to store underground. It has been known to fill its pouches to capacity with date palm nuts to the point of barely being able to squeeze back into its burrow. It has a tawny, buff-gray, or mottled coat of coarse or sleek fur and a pale, cream-colored underside. Its ears are erect and nearly hairless. Long, twitching dark whiskers help it navigate the world. It is limber and lithe, and eager to please (for a treat). Widespread Wanderers. Both species of African giant pouched rat share forests and thickets throughout the continent. Cricetomys emini inhabits Sierra Leone to Lake Tanganyika; and C. gambianus lives from Senegal to central Sudan and south to South Africa. The latter species is trained to work as detection animals. What’s for Supper? African giant pouched rats are omnivores, feasting on vegetables, insects, crabs, snails, and other tasty prey. But favorite culinary treats are palm fruits and palm kernels. They use their handy cheek pouches to carry food and bedding material back to the burrow. Less appetizing is their penchant for coprophagy (eating feces) in times of food shortage. Burrow In. Nocturnal in habit, they dwell in forests and thickets. For shelter, they use crevices, holes, termite mounds, or hollow trees. They sometimes dig their own burrows, with alleyways and different chambers for sleeping and storage. Often located at the base of trees, the burrows can have two to six openings, which they secure from the inside with leaves and debris. In Zimbabwe, much simpler burrows have been reported, consisting of a straight tunnel about 5 feet (1.5 meters) long leading to a nesting chamber at the end. They stow food in the burrow, as well as nonedible items like coins and bits of cloth. Night Moves. Despite having tiny eyes, Cricetomys is nocturnal, suggesting that it relies on its sense of smell to find food and avoid hazards. When observed foraging by day, it behaves as if it were almost blind! These rats are good climbers, using that long tail for added balance. They are good swimmers, too. As detection rats, they tend to start work early in the morning, and knock off by 10 a.m.
Common Senses. This rodent relies on a keen sense of smell and acute hearing to make up for their relatively poor eyesight. Some say they are solitary animals, while others say they live in communities of 20 or so rats, making communication more important. Some of the APOPO giant rats express excitement with squeaks when they are about to be fed, while they are being handled, and even while they are working. A Plethora of Pups. African giant pouched rats may live solitary lives in a widespread community of conspecifics, barring breeding interactions and females with pups. Reproduction takes place at various times of the year; females give birth multiple times in one year. Pups are tiny, but develop rapidly and are weaned in about four weeks. Watch Out/Let Me Pet You. Though these giant pouched rats are timid, they soon become tame in captivity and make interesting companions. Paradoxically, humans are likely their biggest predator, as the animals are in great demand as a food source in some areas. In some West African towns, Cricetomys has become a “sewer rat” and has been killed along with Rattus by rat catchers, while C. gambianus is classified as rare in South Africa. We will share the wonders of African giant pouched rats at the newly remodeled area of the San Diego Zoo called The Sanford Children’s Zoo, opening in 2021. The African giant pouched rat is not under conservation scrutiny. Adaptable, flexible, and reproductively robust, these robust rodents are thriving throughout most of their range. As the IUCN Red List of Threatened Species explains: “There are no major threats to this adaptable species. It is eaten throughout its range, but it is such an abundant species that harvesting is not considered to be a major threat. The species is also used in medical research and has been recorded in the European pet trade. It is considered to be a species pest in some areas.” And they are fine detection animals, making the world a better place for humans. In 2003, the remake of the movie Willard, the star rodent Ben was played by an African giant pouched rat. Pouched rats (Nesomyidae family) are only distantly related to the true rats (Muridae family). APOPO is an acronym from Dutch which translates to Anti-Personnel Landmines Detection Product Development in English. African giant pouched rats Cricetomys gambianus are used as detection animals because of its long lifespan and adaptation to the harsh conditions in Africa. Giant pouched rats are easily tamed as companion animals. African giant pouched rats can detect small amounts of TNT buried 8 inches (20 centimeters) deep, as well as from a distance of about 3.2 feet (1 meter). Rats trained by APOPO are not distracted by other objects or odors as they look for TNT or TB, while ignoring other contamination. The “pouched rat” refers to their cheek pouches used to store and transport food and bedding material.